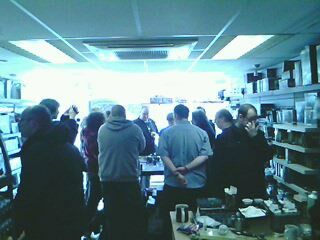 It was Tabletop Day today and there was a huge gathering at Titan Games in Lichfield. Proprietors Martin and Adam opened their doors at 10 o'clock this morning and aimed to do a full 12 hours of non-stop gaming- I left at three o'clock and the poor guys looked ready to keel over! They'll be putting up a battle report on their Facebook page after the event so no doubt we'll hear a lot about sore backs and spinning heads! 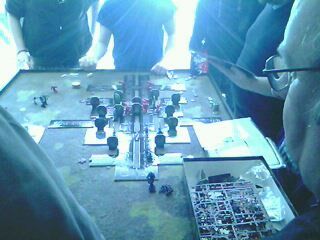 There were games galore today, old and new. I watched games of Space Hulk, Spartacus, Warmachine, the good 'ol classic boardgame Colditz , Ticket to Ride, 40K, all kinds of things were on the go and everyone was having a blast. I bought along some classic D&D and other RPG stuff, as well as a couple of card games, but there was so much going on that I doubt that every game bought along today was going to get a look in. Well done to Adam and Martin for putting on a great event, it was a great day. No doubt they'll share a lot of their own images, but in the meantime here's a few dodgy cameraphone shots of the day - I did have a proper camera with me but the battery decided to die. I guess I shouldn't have left it turned on in my game bag. Happy Tabletop Day , everyone! Titan Games, Lichfield - and this was BEFORE it got busy! The recent edition of Space Hulk, all guns blazing. Just as complicated as I remember it! 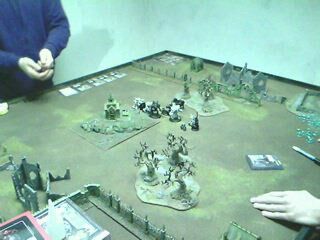 A battle of Warmachine comes to a conclusion. 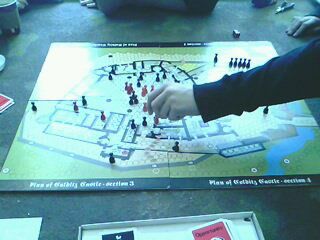 Blood and Sand and Dice in Spartacus. Fantasy campaign setting histories - how much detail do you need? Here's something I thought I'd share with you. A very long time ago I designed a grim fantasy campaign setting called 'The Last Island' and I'd designed the entire place including it's history. The only thing I have left of all that design work is this back story below, which I wrote so that potential players could read it and get a sense of depth and history. As it happened, all of this was completely superfluous. The campaign started with the PCs being hired by the King to find the Book of Making, which is why the back story stops so abruptly as that was where the story continued with the PCs, but it turned out they had no interest in the history, they just wanted to get on with the adventure. So how much detail would you go into? The story below is quite long and detailed but, ultimately, it never really got any use. I think, perhaps, I wrote it for my own edification as I wanted to fill out the history and give the setting a sense of depth, for me if for nothing else. I do know that I've never written anything as detailed as this since. I now concentrate on where the players are going, and not what's come before. After all, all they're interested in is the adventure to come. Do you think what I wrote below was worth it? This is a long post so I apologise in advance. First, there was Evil Deceit, with eyes of bright silver, who came across the Veil that is the cloak of stars and decided upon a game. This game was the First Land, the Land We Do Not Remember, and Evil Deceit dragged the First Land from the Waters of Eternity, pulling it from the depths of the ocean with such force that the waves crashed and the sea boiled with fire. The First Land was borne from evil thoughts and harsh dreams, so the mountains gushed forth fire and smoke and fed the red rivers of stone that ran as water. The black and grey earth of the First Land was covered with fields of ash and plains of barren rock. And Evil Deceit gazed upon the sculpture that was created and smiled with glee as the shape of the First Land was torn and remade with every belching mountain and every shake of the foundations. But soon Evil Deceit became bored of the First Land and decided to create creatures that would roam the surface. And so Evil Deceit created the creatures of no purpose, formless and shapeless denizens of the First Land. And the creatures of no purpose stumbled blindly across the ash-covered surface and wailed in their torment. Evil Deceit soon became bored with this game and, after much cajoling, managed to cause war between the creatures of no purpose. Evil Deceit discovered that by whispering in the minds of the creatures of no purpose and turning them against one another there was sport to be had. The creatures fought savagely for the amusement of Evil Deceit who found their machinations an entertainment, bored as he was with life in the firmament above the Land We Do Not Remember. For time immeasurable the creatures of no purpose fought with one another over the First Land, the Forever War, a desire to conquer and spread injected into them by Evil Deceit who watched with his eyes of bright silver. And for time immeasurable they knew no different. But the war was not to last. With war came growth and change and the creatures began to question their existence and their meaning, and Evil Deceit was concerned at their thoughts. So Evil Deceit created Forms of Shadow and Smoke, the Betheresti, and these deamonic creatures smote those creatures of no purpose who had such thoughts. This way, Evil Deceit could continue the Forever War. But the voices of the creatures of no purpose grew louder until they reached a deafening crescendo in the mind of Evil Deceit, and no matter how many Forms of Shadow and Smoke that swept through the First Land in their endless slaughter, the pain was too great. And Evil Deceit cried out in agony and sent a wave of fire across the First Land that destroyed all. The Forms of Shadow and Smoke, terrified of their master’s great power, hid themselves in the deep cracks of the earth. Evil Deceit, drained by the act of cleansing the First Land, fell to the fields of ash, utterly spent. Only two creatures of no purpose escaped the wrath of the Cruel God and these formless, nameless beings held each other in the dark and disregarded the Forever War in their terror. The cries of Evil Deceit echoed beyond the Veil that is the cloak of stars and were heard by Blessed Truth, who recognised the voice of an enemy. So Blessed Truth came from beyond the Veil and gazed upon the First Land with sorrow. The creation of Evil Deceit groaned and heaved as a dying creature, scorched by flame, scarred by fire, wounded by deep cracks, and in all this could be heard the whimpers of the two creatures of no purpose. Blessed Truth, whose heart was full of the joy of existence, felt pity, and pity turned to sorrow, and sorrow turned to weeping. The tears that fell from the eyes of burning gold of Blessed Truth fell upon the First Land and cleansed it of the dark designs of Evil Deceit. The mountains stopped spewing their fire, the rivers of stone that ran as water hardened, the flames were quenched. The ash was washed into the great seas that were formed around the First Land by the great sorrowful weeping of Blessed Truth. And the First Land was cleansed. Evil Deceit, made nearly powerless by the great flaming ruin that he had cast against the First Land felt the sting of those tears and retreated hurriedly, disappearing with the Betheresti into the darker places of the earth to regain strength. After a long time the tears, the Rains of Change, were over. Blessed Truth gazed down upon the First Land with eyes of burning gold, and saw that under the black rock and ash was a place that could have been beautiful. Sadly, Blessed Truth prepared to return beyond the Veil. But the whimpers of the last two creatures of no purpose could still be heard. After a little searching Blessed Truth found the two formless beings clinging to each other at the foot of the greatest mountain now called Car Toil. “Why do you cry so, small children of the Land?” asked Blessed Truth. But the creatures had no ears to hear Blessed Truth with, so Blessed Truth gave them ears. But they had no language to speak with, so Blessed Truth gave them language. And Blessed Truth stepped across the hills and mountains of barren rock and came upon the field of ash, but there was no sign of Evil Deceit, but the place where he had fallen to the earth in exhaustion was covered with the stench of darkness. And so Blessed Truth surrounded the place with water and separated it from the First Land, and proclaimed it forbidden to all that knew of it. For the stricken land crawled with the sickening wailing and the mournful cries of the many dead spirits of creatures of no purpose, who knew only slaughter and destruction, and Blessed Truth called it Adenn Marred, or the Isle of Wraiths. Upon returning to the creatures of no purpose Blessed Truth found them weeping. “And what ails you know, small children of the Land?” asked Blessed Truth. And Blessed Truth retreated beyond the Veil. So, with the Book of Making, the creatures of no purpose cast their spells and formed the Land into a shape most suited to their needs. Trees they created for shelter from the eye of burning gold, rivers of water for sustenance and refreshment in the heat of the eye of burning gold, rains for cleansing and winds to remember the soft breath of Blessed Truth by. With these trees and rivers and rains and winds came the grasses, the ferns, and all the greenery we know of, and the creatures found a new purpose, to create and make good their Land. And all the time they created with the Book of Making, they were aware of Blessed Truth’s one requirement not to create other creatures such as themselves. And the Land grew in beauty. As Man and Woman aged, as they were to without the power of Blessed Truth to sustain them, they had many children. And these children had many children, and the numbers of the creatures of purpose grew and grew until the first great city, Mondadruil, the Wooden City, was built to house the numbers. And Man and Woman, whose true names are lost to the echoing depths of time, watched their land transform as they wished it. And they created animals that walk, fly and swim to share the Land, for Blessed Truth had forbade them to create creatures such as their own kind, but these creatures were not the same. And the descendants of Man and Woman marvelled at these creatures. Many years passed since the Land had been transformed, and Man and Woman were both of such an age that their skin hung loosely from their bones and their hair was white. And in these winter years of their lives, a black-cowled old man who spoke of things that could be visited them. And the black-cowled man threw back his hood, and Man and Woman gazed into the eyes of shining silver, and terror took them, and they passed beyond the Veil. Evil Deceit cast aside the form of the old man and greedily grabbed the Book of Making, hoping the power stored within its blessed pages would restore his strength, but upon reading the words a great pain took him and his body withered. One of his eyes of burning silver was burnt from its socket, and he fled the Wooden City of Mondadruil, trapped forever in the form of a withered old man, cursing mankind and retreating to the dark places where his agents of Shadow and Smoke awaited him. Great was the mourning of the many children of Man and Woman, whose true names are lost to the echoing depths of time, and for many days did they sit in the light of the eye of burning gold begging for the return of their forebears. Their bodies were buried in a vast place, and they called it Toildruil, the City of the First, and the location was kept secret so that Man and Woman could rest in peace, and the whereabouts of the city is lost to us today. And in the darkness of the world Evil Deceit made his plans, for the Book of Making was not for him to read and yet he coveted it, wishing for the power he once had before spending himself in the formation of the First Land and the slaughter he inflicted. And he saw a new way in which he could control the descendents of the First. For Evil Deceit is the master of lies and conspiracy, so he used his skills well. The stench of Evil Deceit was still on mankind, and all of the children of the First had the capability of cruelty and lies inherited from their forebears, and Evil Deceit knew how to manipulate this to his own ends. The first son of the First took up the Book of Making and continued the work of his forebears, creating new things that pleased his people. But all the while he created, the voice of Evil Deceit whispered in his mind. Although he thought them only dreams, the will of Evil Deceit was being done. Until, one day, the first son of the First, whose true name is lost to the echoing depths of time, woke to the feeling that he could do more than continue the work of his forebears, and he gathered his people about him. The people were confused as to why the first son of the First would wish such a thing. They could not know that Evil Deceit had used his guile and insidious whispers to plant the seed of disobedience in the mind of the first son of the First. The first son believed the idea to be his own, whereas in reality it was the machinations of Evil Deceit. The people were aghast. How could the first son consider such a thing, against the will of Blessed Truth? They recoiled in shock and anger and some even called for the first son to be cast down from his lofty position and the first daughter to take his place. But the first son of the First would not be dissuaded from his aim. In secret, he spun the power of the Book of Making into a form that would serve him well, and the Ogres were born unto the world. The great green-skinned Ogres, standing taller than most men and more powerful than an ox, set about their work. Little by little, they bought down the stone and rock from the mountains and moulded it into shapes, and with these shapes they constructed the great Dronandruil, the Stone City, upon the foundations of Mondadruil, the Wooden City. At first, the people fled the great Ogres as they constructed the city, fearing their might and their power, but as the great city of Dronandruil took shape they saw the beauty that such great hands could craft. The streets were paved, the buildings of many colours glittered in the light of the eye of burning gold, and towers rose high into the air. The Ogres taught the children of the Land the skills that they knew, and together the small children and the great Ogres finished the city. Dronandruil stood glittering at the base of Car Toil, the mountain where Man and Woman had hidden from the revenge of Evil Deceit, and the people were glad. A great tower was built to honour Blessed Truth, the Lord of Honesty who had enlightened the people so, and it reached the cloudy sky, almost, some say, to the Veil itself, and they named it Ceress Dansuin, or Blessed Building. And they danced and drank and loved, and the Ogres, their purpose clear, built more places for the people to live with no thought for their own comfort, and the Land rang with song and joy. And then Blessed Truth returned. Blessed Truth, through the spirits of Man and Woman who had crossed the Veil into the Realm of Paradise after they had passed from the Land, had learned of Evil Deceits advice to them regarding the Book of Making. Concerned for the welfare of the Land, Blessed Truth passed through the Veil and alighted upon the world. Great Dronandruil glittered in the light of the eye of burning gold, and the tower of Ceress Dansuin stretched high into the air, and ribbons and pennants swung lazily in the breath of Blessed Truth. And at first Blessed Truth marvelled at the sight, and wondered how the people could have learned the skills of moulding stone and rock, but then spied the Ogres working on new glorious places. And Blessed Truth understood. And Blessed Truth sucked in the air of the Land and bellowed in fury. The skies boiled and the clouds became as thick as mud. The rain lashed the Land and the sky lit up with flashes of lightning and roared with angry thunder. The children of the Land and the Ogres cast themselves down and wailed in fear as Blessed Truth vented anger upon all of creation. And the great city of Dronandruil trembled, and the foundations cracked and the buildings shook apart, and the tall tower of Ceress Dansuin was cast down into ruin. And when spent, Blessed Truth fell to the ground exhausted. The children of the Land and the Ogres gathered about the form of Blessed Truth in reverent silence, terrified at the results of their folly. The first son of the First approached, the Book of Making in his hands, and laid down beside Blessed Truth. “Forgive us, Lord of Honesty, for we have failed you,” he wept. “To mould stone and rock,” the first son said. And Blessed Truth stretched out a hand to take the Book of Making from mortal man. Evil Deceit was aghast. What fortune had come to be? Blessed Truth lay broken and near powerless on the Land, and the eye of burning gold was smothered by the thick boiling clouds. He would never have a better chance to strike! As Blessed Truth stretched out a hand to take the Book of Making, the skies came alive with the great winged daemons of Shadow and Smoke. Evil Deceit sent them forth and the children of the Land fled in terror. Evil Deceit stepped from the darkness and the smoke, and as Blessed Truth stood to confront the Lord of Lies, the first son recoiled with the Book of Making still in his hands. And Evil Deceit tore his one good eye from his face and cast it into the sky, and the eye of shining silver hung there gazing down on all creation as the sky was dark. And Blessed Truth, aghast, tore out his other eye and cast it into the sky, where they hung in the sky to gaze upon all creation as the sky was light. Then they locked their hands around each others throats and blindly struggled upon the Land. They ascended into the sky where they joined their eyes, and the neverending struggle between light and darkness was begun. Blessed Truth and Evil Deceit struggle still, with the eye of burning gold travelling the sky through the day and the eye of shining silver marching by night. And as the struggle continues the eye of shining silver, the moon, comes and goes, and the eye of burning gold, the sun, rises and falls. And when the moon waxes and wanes then this means the power of Evil Deceit is victorious and beaten, and when the sun warms the Last Island in summer but grows cold in winter then Blessed Truth is victorious and then beaten. And they still speak to us, when you listen hard enough, for their cries can be heard in the thunder and the wind and the crashing of the seas. Mankind retreated into the walls of Dronandruil, terrified of what they had done and witnessed, and the first son, whose true name is lost to the echoing depths of time, hid himself away. In the highest tower of Dronandruil the first son withered and died, and it is said his spirit was drained by the Book of Making, which punished his sins for its creator Blessed Truth. And the first son of the first son, whose hair was black and whose face was bright, and who was called Gethren, took the book from the withered hands of his father and proclaimed, “These pages would be the doom of mankind.” And he hid the Book of Making away in the deepest vaults of the city of stone. And mankind rebuilt the city, and rose the tower high once more so that they could be closer to their Lord of Honesty whose two eyes of burning gold glittered in the day, and they wept for many a year for their transgressions. But soon the fault disappeared into history, and mankind looked once again to the future. Whilst the city was being rebuilt the agents of Evil Deceit, the Betheresti, hid in their dark places and brewed their anger against Blessed Truth who had stolen their master. And they plotted and schemed, knowing they would one day have revenge on that most hated of enemies. At first they planned the downfall of mankind but they had no army. Only twelve of the Betheresti remained and although they were blessed with long life they knew they could not defeat their enemies. They decided on a course of action that would take many an age but would bring about a revenge darker than the blackness of their hearts. As man and Ogre toiled in Dronandruil in the day under the two eyes of burning gold, the agents of Evil Deceit stalked the night under the eye of shining silver, for the suns caused them great pain. And from the city they stole two of the children of the Land, a man and a woman. They were called Brunen and Hethel, and they would become the father and mother of a race hated by all things. Using dark magics left to them by Evil Deceit the twelve Betheresti twisted and reformed Brunen and Hethel until there was nothing left of the heart that Blessed Truth had given them. Their bodies became twisted and gnarled, their skin turned grey, their teeth cracked and rotted and their eyes turned black and yellow with no hint of love or compassion. Hairless and without spirit, they began the first race of evil, the orcs, some of which walk the Last Island still. The numbers grew with the aim of a grand army the Betheresti could send against mankind to exact their revenge. But all the while they had their eyes set on something greater. The Betheresti still sent offerings to their Lord of Lies and, although locked in eternal battle with Blessed Truth, Evil Deceit heard their pleas and helped as he could. Only when the eye of shining silver was full and his power at its greatest could Evil Deceit talk to the Betheresti in their dreams, and he told them what they must do. And the agents of Evil Deceit heard their master’s wishes and they planned and plotted and schemed. There was only one place where they could reach the eyes of burning gold and that was at the top of the highest place in the Land, that of Ceress Dansuin, called Ceress Dansuin Etol now it was raised once again for the honour of Blessed Truth. So the aims of the Betheresti were twofold; war against the children of the Land, and climb to the top of Ceress Dansuin Etol and steal the eyes of burning gold. The leader of the Betheresti was the favourite of Evil Deceit and he named himself Ynoc, and it would be he who would have the honour of taking the eyes. Mankind rebuilt their city of stone and raised the tower of Ceress Dansuin, now Ceress Dansuin Etol, into the sky, higher than any mountain peak, even higher than Car Toil, the First Mountain and its sister Car Etol, the Second Mountain. To appease their Lord of Honesty the children of the Land carved upon its face shapes denoting the many creatures of the world they had created, so great birds and hounds and wolves and other beasts decorated its shining white stone. Once it was finished the people waited for a sign from Blessed Truth, but none was coming. Gethren, saddened by the silence of the Lord of Honesty, retreated to the top of the tower and spent ten days and ten nights and took neither food nor water waiting for a word from his Lord. On the night of the eleventh day he fell into a stupor and, as his eyes closed, a voice whispered in his head. And Gethren came awake suddenly, filled with a new resolve and an image in his heart. He would use the Book of Making to create a new race, one that would be suited to the Land beyond anything imagined by Blessed Truth. But Gethren could not know that it was Evil Deceit who had whispered to him in his dreams, for that which sounds sweet to one is bitter to another. Gethren opened the pages of the Book of Making and as he felt the power rising in his body he stretched forth his hand and wrote within the pages his heart’s desire, willing it into being. The creation was a great winged beast with a breath of fire and eyes of diamond. The first dragon walked the Land. The children of the Land were at once terrified and awestruck. Such a beautiful creature and yet, with its towering form and horn-studded head, as horrifying as anything they had ever seen in their nightmares. The dragon looked upon the people and smiled a smile that caused women to swoon and men to hold their hands to their eyes for fear of being bewitched. “I shall do this, Lord, and I shall do it willingly,” the dragon said. And the dragon came to be known as Ceress Wyrmyrtoil, the Blessed First Dragon. Gethren climbed up between the great shoulders of Wyrmyrtoil and, with one great sweep of his wings, the dragon launched himself into the air and Gethren was able to see the domain he ruled. And with passion he held the Book of Making aloft and proclaimed himself and his descendents following to be the Kings of the Land. Evil Deceit had placed in the heart of the first of the Great Kings the desire for power, and it would be a disease that would never leave the hearts of many of the children of the Land. Now Gethren had a wife, Gwyniol, and she despaired at her husband’s actions as he rode away on the back of his creation. Already she could hear the whispers in the halls of her house and the streets of the city of Dronandruil as the people wondered what they could do with the Book of Making. Wild ideas, some wonderful and some disturbing, were cast about with abandon, and in the eyes of some Gwyniol saw jealousy of the first of the Great Kings. All she could see was toil and hardship as these stares were filled with pride and wonder, and she felt fear at the prospect. One hot day she lay resting on her bed wondering at the future of the Land, and in her head she heard a soft pleasant whisper. As Gwyniol awoke she knew her course. The Land must be rid of the Book of Making. But how could she accomplish such an impossible task? The Book of Making was the cherished possession of her husband and he carried it with him wherever he went. Even in sleep he held the Book to him as he would his own child. She knew that when he was forced to abandon it for even a little while he left it in the care of Ceress Wyrmyrtoil, and the dragon guarded it with a ferocity that thwarted even passing thoughts of theft. But determination steeled her and she thought long and hard how to be rid of the Book of Making. She could not act against her husband directly whilst he held the Book for she loved him dearly and would not see him harmed or betrayed, for she did not think she could live knowing that he saw her as a traitor. She came to the unhappy conclusion that she would have to move against the dragon whilst the Book was with him. The mere thought of facing the beast almost caused her to abandon the plans immediately. As more creatures appeared across the Land at the behest of King Gethren, and more whispers spread through the city of Dronandruil like fire through dry hay, Gwyniol decided on her cause of action. Battling the great beast was impossible so she gathered her most trusted servants and aids and, unknown the them, formulated a plan to create a draught powerful enough to send the beast to sleep, enabling her to take the Book of Making without the need for bloodshed. Through her servants and aids she learned of many potions and tonics that she secretly collected. The dragon dwelled within a deep cavern under the King’s palace, the Druil-Tunree, the City Heart, and she knew he drank from a small stream that ran through it. She would have to hide in the cavern and wait until the dragon drank from the stream, and as he did so she would pour the potion into the water. Once asleep, she could take the Book of Making and destroy it. One night, whilst her husband met with the Lords of the lands in deep discussion over what next could be created by the Book of Making, Gwyniol crept into the deep cavern where the dragon rested. She hid herself away in the darkness near the opening of the stream and awaited the return of Ceress Wyrmyrtoil, with a huge wineskin filled with the draught she had created. After a long while the dragon crawled into the dark place, lit only by a single shaft of light from the roof of the cavern, and wrapped himself around the Book of Making. As he stretched his neck to drink from the running stream Gwyniol poured the contents of the wineskin into the torrent and watched the dark liquid mix with the clear water. The dragon drank much and, after many great swallows, he returned to his vigil, the Book nestled between his huge claws and his gargantuan mouth. His eyes were alert and blazed at every sound but before long he was soundly asleep. Gwyniol crept from her hiding place and approached the beast, hurrying as fast as she could for she had no idea how long the potion would keep such a gigantic beast in slumber. She was horrified to see that the dragon had drank so much of the potion that he was as a thing dead, the huge form slumped over the Book. The Book itself had slipped partially inside the huge mouth and she was hard pressed to pull it free. After much struggling she finally managed to take it away from the dragon, but, in her fervour to do so, a page was torn away on one of the dragon’s teeth. Before she could take the lost page out she heard footsteps echoing from the mouth of the cavern. Her husband had returned for the Book. Quickly, she hid herself away once again in the darkness and watched as King Gethren approached the dragon. Upon seeing that Ceress Wyrmyrtoil slept and with no sign of the Book Gethren went into a rage. He pounded the nose of the beast fiercely, calling for his attention, and it was a while before one of the glittering eyes finally opened. Slowly, and with a seemingly great effort, the dragon lifted his head. “What wouldst thou have of me, my King?” Ceress Wyrmyrtoil rumbled. “Where is the Book, sleeping beast?” King Gethren cried. The dragon looked about him. “I know not, my King,” he said with much concern. It might sound like a bad thing to say but let’s face it; a lot of roleplaying games are really two-dimensional. You have sword fights, defeat the monsters and bad guys, solve mysteries and blast about in high-spec ships popping bolts of light at the enemy. There’s magic and explosions and lasers and bombs and monsters and.... that’s pretty much it. It’s very easy to look at roleplaying as a pretty black-and-white thing and in many respects it is. When you first see classic good-versus-evil movies, like the original Star Wars, you want to cheer the good guys and throw popcorn at the bad guys. It’s very easy to see it as a big dumb action movie. But what about that scene in that movie when Luke Skywalker went racing back to his uncle’s farmstead to find the bodies of his guardians torched, the home burning? Highly dramatic music coupled with heart-wrenching visuals. It pretty much hit home with everyone and made for an emotional scene. Or how about when Gandalf fell from the bridge in Moria? Who wasn’t moved? Or Luke finding out that Darth Vader was his father? Or when the Colonial marines are first attacked in Aliens? Take a long hard look at these kinds of films and you’ll see scenes far beyond black and white. I’m a bit guilty myself; for a long time I craved adventure in the Lord of the Rings and Star Wars settings and I simply re-created the high from the highest-octane scenes in the books and movies. I didn’t see the drama behind the narrative or the special effects, which was not wholly my fault considering the tension scenes are what you take away from things like that, and after a while my games and creations started to suffer from it. Unoriginal games gambolling over into the next one, each one the same as the last but with different locations and names. 1. Throw a shocking revelation into the works that forces the players to rethink the direction of the game. 2. Give the players something to sink their teeth into instead of the next puzzle or threat. The emotional shock of a sudden revelation or an unexpected incident during a campaign can heighten emotion and make quite an impression on the players. Important - The Golden Rule is: Don’t Embarrass Anyone! The difficult thing is the most important thing, unfortunately - how are you going to insert a scene that makes sense to the story and is an emotional shock to the players? Let’s use Star Wars Episode V - The Empire Strikes Back as an example. The scene with Luke Skywalker and Darth Vader is a classic and is down as one of the most dramatic moments in cinema history. The revelation of the father and son relationship is well placed and totally unexpected yet subtly clever. You knew that Obi-Wan Kenobi and Vader knew each other, knew that Vader was Obi-Wan’s pupil from the talk they had in Episode IV, knew that Vader was supposed to be responsible for Luke’s father’s death. The only thing you didn’t count on was Obi-Wan keeping it all a secret but when the truth does come out you can understand why. It all slots in nicely and makes a lot of sense, but the crunch comes when Vader reveals to Luke that he’s his father; not in a roundabout kind of way, mind you. He waited until he’d beat the snot out of him, cut his hand off and had him hanging off a vane over a shaft before he told him – now that’s drama! So how can you set up such a thing in a game and make it work? 1. The first thing you can do is take a long hard look at the character backgrounds the players have created for their alter egos. There is always little snippets of information in there you could use and more times than not the players have created things about the past and haven’t really taken much notice of it, or have detailed friends and relatives they knew but don’t take much notice of. You could take the details of the person, flesh it out (without the player’s knowledge) and introduce him or her (or it) as an NPC at a key moment, or have them a long-term NPC whose identity isn’t revealed until later. Wouldn’t it be cool if the players spent game after game trying to figure out who the bad guy is and it turned out it was one of their brothers? Or a friend they bullied at school? Or a relative they thought dead? 2. If you keep notes during a game then so much the better. Even the smallest plot point from a previous game might come back to haunt the players. Perhaps, in a game a long time ago, the players hired some help and they all went on an adventure. Lets say the hired NPC was killed and the players escaped without them. But, wouldn’t it make for a good story if the NPC wasn’t killed? Wouldn’t that NPC swear revenge on the PC’s for leaving them for dead? In this way, the game makes it’s own internal plot that, because the players were involved with it, makes it resonate more. 4. Pick a location where the dramatic revelation can take place. This will have to be a place that will be detailed to the players so that the importance of the dramatic event has a visual representation. This could be anything – the top of the highest tower in a thunderstorm; a deep, lava-filled cavern; the top of a collapsing starship hull; the thin bridge over a deep rocky gorge (Indiana Jones, anyone?). 5. In some extreme cases it can even be a situation designed by the GM and a player, with them getting together to sort out a private agenda for the player he carries out, and when the other PC’s find out it’s even more of a shock! You have to be very careful with this option - the other players who aren’t in on the secret may feel a little left out, even a little used and offended, if they think the GM was favouring or singling out a player that was working against them or secretly being favoured. For example, let’s say that a character called Jevin Dayy has had her background fleshed out in a sci-fi game by the player. Just to make the character more interesting the player has entered details about a father she had, who was a business man who she ran away from because of his anti-adventure and miserly feelings, which explains her well-spoken manner but also her dislike of safety-conscious people and money-hoarders. She loves her father but can’t condone what he is doing. A nice little detail she added just for effect. Jevin has been used for quite a few games and is very good at what she does (a technician with the group) but the GM decides that one day on-planet she works on a vessel she recognises - one of her father’s business vessels. What will she do? Carry on as if nothing has happened? Run for it? She’s quite capable of doing these things but then finds out that the man who is now running the company is her fathers’ brother, her uncle, who has basically murdered his predecessor to take over the business. This is revealed during a moment of high drama to increase the emotional charge of the event. Let’s say that her uncle knows she is trying to find out about how her father died and sent men after her. She assumes it’s her father’s murderers trying to get her but, whilst she’s crawling to safety over an old rickety steam pipe over a shipyard, her uncle catches up to her. “Get away from here, uncle! It’s dangerous!” The pipe creaks and she hangs on for her life. “Jevin, come back, it’s dangerous out there!” he holds out a helping hand. “It’s the men who killed my father! We have to get away before they get you, too!” She despairs for her uncle’s safety and grabs hold of his offered hand to pull herself to safety. “No, Jevin, I came out here myself. These men are my employees.” He tightens his grip. See how that works? It doesn’t need to be a character that was created for the PC background; it can be a long-running NPC that the players know from previous scenarios or campaigns. You also have to be sure that the emotionally charged scene your about to put in isn’t going to make anyone sat around the gaming table uncomfortable. After all, some of them are there to just game and not get emotionally involved and having one of the NPC’s suddenly leaping forward shouting ‘I love you!” or something or other can be a bit of a shock, especially when most of the game has centred on action and adventure. Remember, also, that the scene you’re going to introduce has to be a shock that’s not out of context and just suddenly appears out of nowhere. That can be embarrassing for the GM as well as the player. Here are a few lines you could use as a basis to charge the scene, just for a bit of fun. Try to see if you can insert these NPC phrases into a game and get the emotional response needed - it’s a laugh. Competition: WIN A COPY OF ‘ANCIENT ODYSSEYS’ FROM PRECIS INTERMEDIA! WIN A COPY OF ‘ANCIENT ODYSSEYS’ FROM PRECIS INTERMEDIA! Farsight Blogger and Precis Intermedia have got together and are offering one lucky person the chance to win a copy of the pocketbook edition of ‘ANCIENT ODYSSEYS’, the introductory roleplaying game! 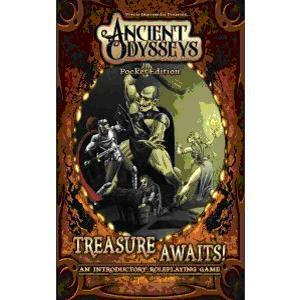 The ENnie Award-winning Ancient Odysseys: Treasure Awaits! 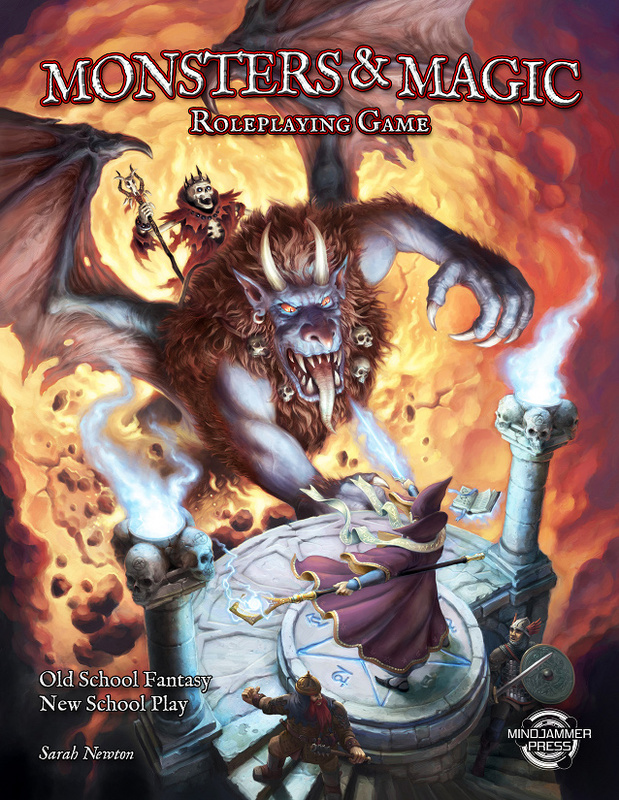 is designed as an introductory fantasy roleplaying game that lets you start playing in less than 10 minutes. Playable either as a solitaire or multiplayer game, Treasure Awaits! requires only a single six-sided die for quick and easy resolution to conflicts. Experience perilous traps, vicious monsters, toxic poisons, powerful magics, mysterious potions, and valuable treasures. Even if you're a veteran gamer, this new take on an old style of gaming will relieve your retro-fantasy cravings. Begin with the basics of play, proceed to explore and loot a ready-made dungeon, and then learn how to create your own exciting adventures. Everything you need is included, but does not limit the possibilities. For those who like to tinker and add house-rules, the consistency of the mechanics makes that a breeze. Gather your friends and lead them on a daring quest for glory, whether they're sitting in front of you or via web-chat. And if they can't come out to play, the game also supports a solitaire experience using pre-made dungeons or on-the-fly random tables. Unleash your imagination and enter the dungeon. What year did ‘Ancient Odysseys’ win the Judges Spotlight Award at the ENnies? Send your answer to farsightgames (at) yahoo (dot) co (dot) uk and include in the subject header ‘AO compo answer’ with your answer in the main text. Don’t give me any other details, especially any postal addresses! I’ll contact the winner via email; the closing date is April 30th 2013 and within a week of the competition ending I’ll pick a random name from anywhere in the world – that’s right, this competition is open for anyone worldwide! - and send you a message looking for a postal address. Entries must be in by midnight (GMT) April 30th 2013. Competition is not open to employees (or members of their immediate families) of Precis Intermedia or Farsight Games/Farsight Blogger. Only one entry per person. No responsibility can be accepted for entries that are lost or delayed, or which are not received for any reason. The winner will be the entrant who is drawn randomly from the entries. The closing date is April 30th 2013 and we reserve the right to amend the competition end date at any time. If you win the competition, we will notify you by e-mail. The judges’ decision will be final, and no correspondence will be entered into. The prize will not be transferable to another person. No part of the prize is exchangeable for cash or any other prize. If an advertised prize is not available, we reserve the right to offer an alternative prize of equal or greater value. Incorrectly completed entries will be disqualified. We reserve the right to amend these rules at any time. We will endeavour to send prizes within a month of the competition end date but cannot guarantee this delivery time. The private information of entries will not be shared with any third party companies or publicised in any way or form. I'm a bit of a fan of fan-made movies. There's a huge glut of them out there and mostly it's about a group's love of a genre or franchise, like Star Wars or Lord of the Rings. Over the years there's been some very slick and professional fan-made productions and then there are some that pull out all the stops and simply go for it. The H P Lovecraft Historical Society's (HPLHS) movie 'The Call of Cthulhu' is one such pull-out-the-stops movie. Instead of doing a simple, filmed-on-a-camcorder-in-some-home-made-clothes movie, or an attempt to update the classic story to the modern age to save on budget, the HPLHS society decided to make a pretty accurate story. And make it in black and white. And it's a silent movie. And it has classic stop-motion effects. Okay, let me explain it this way - imagine that there was a studio back in the 1920s who decided to make their silent movie version of 'The Call of Cthulhu'. They filmed it, added some Willis O'Brien style stop-motion special effects, and allowed a couple of disturbing scenes of mutilation and insanity to get past the censors of the time. That's the movie you have here; an almost faithful adaptation of the story made to look like a classic silent movie, made by lovers of H P Lovecraft, with some great performances by the actors (some of whom are HPLHS members) and an excellent soundtrack. It's a wonderful movie and, even though there are a couple of things that show it's modern-day technology and lack of budget, it's well worth a viewing. From the HPLHS website: ...a dying professor leaves his great-nephew a collection of documents pertaining to the Cthulhu Cult. The nephew begins to learn why the study of the cult so fascinated his grandfather. Bit-by-bit he begins piecing together the dread implications of his grandfather's inquiries, and soon he takes on investigating the Cthulhu cult as a crusade of his own. As he pieces together the dreadful and disturbing reality of the situation, his own sanity begins to crumble. The quality of the movie is excellent. In high definition you can see that the quality is modern film equipment given some post-production treatment to make it look like a silent film - well, it's not like there's some hand-cranked 1920s cameras just lying around, is there? - but the quality is constant throughout the movie. Once you start watching it the format is static so there's no being pulled out of the atmosphere by a sudden change in film making techniques. The makers have gone to great lengths to make sure that the movie has the same style all the way through and they've done really well. The writing is nice and simple - it's a silent movie, after all - and they've managed to capture the best parts and essence of the story. The acting is pretty good and everyone plays their parts well. I liked the min character 'The Man' (played by Matt Foyer) and the sailor Johansen (Patrick O’Day), their performances were especially good. There were obviously a lot of challenging parts of the story that might not have worked on a fan film, especially the entire ship/dead city sequence, but the nature of the movie makes the lack of budget negligible, in the fact that, back in the 1920s, their own technology would have been limited so they would have to make do. I especially love the fact that instead of relying on modern-day computer technology to build Cthulhu himself, they went back to classic stop-motion techniques. Yes, the models, fake sea and the animation looks weak by the standards of today's CGI extravaganzas but the movie has to be watched as a classic silent film. You know they're slightly off the mark but you forgive them that fact because it was simply the tech they had at the time, and knowing that does not detract from the finished product. It's like comparing the modern-day CGI King Kong to the stop-motion King Kong of 1933. Different era, different capabilities The sometimes erratic nature of the original Willis O'Brien animation does not in any way detract from the wonder of the 1933 original, and that same attitude should be applied to 'The Call of Cthulhu'. The makers of the film have really tried to capture the feel of the silent era. It's not for everyone, that's for sure, but as a man who grew up with the original King Kong and all of the Ray Harryhausen classics I can see past the limits of technology. The makers of this film should feel very proud about what they've made here. It's the first true adaptation of a H P Lovecraft story I've seen on screen and I'm looking forward to a lot more. The film industry should take a closer look at films such as this, and Lovecraft's Mythos as a whole, and see that these horror stories can be put on the screen without the need to update them to the modern age or turn them into gore-fest slasher flicks. The big screen is overdue a truly great Lovecraft adaptation and this small movie paves the way to realising that goal. Let's save The Clone Wars NOW - it's our ONLY hope! We’re hearing, along with our friends at RebelForce Radio, that The Clone Wars team at Lucasfilm will be disbanded imminently and this is our VERY last chance so save The Clone Wars. We were one of the first to break the news that The Clone Wars had ended and we want to be part of the group of fans that helps save it – even if it’s only a direct to Blu-ray/DVD release. The remaining episodes that are finished or in part-production do NOT in any way wrap up the fates of the Ahsoka Tano, Captain Rex, Darth Maul, Asajj Ventress and many others. If you want these stories to be told that we must act NOW as a community before it’s too late – time is NOT on our side. Send letters NOW to Bob Iger, Kathleen Kenedy and George Lucas asking for a conclusion, leading into the events of Revenge of the Sith, at the addresses below. I wasn't sure what to make of this as I began to read it. The cover promised some pretty great looking science fiction and the image of the woman crying with the pseudo-shuttle blasting off behind her was intriguing. 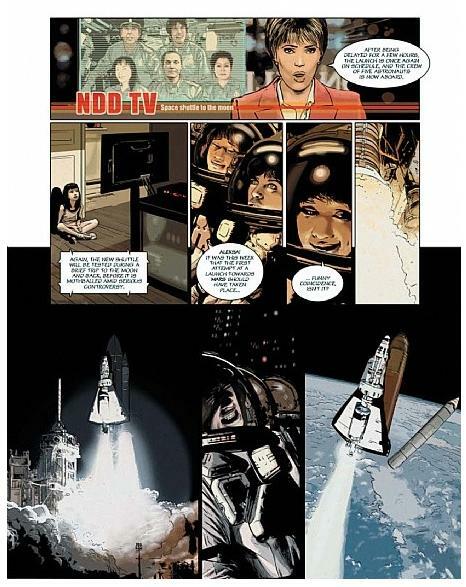 So, once I got stuck into it and the first reveal was not only intriguing as promised but incredibly confusing and unexpected... Neil and Buzz from the Apollo 11 mission? What the... ? Well that's how I like my science fiction. The problem is that discussing the reveal and the following incidents will take away the power of that plot, so I'll not discuss it any more here. Jean-Michel Ponzio's art is perfect for a piece like this and I'm already a fan of his work that he did for 2000AD. The story follows the struggles of Helen Freeman and her professional and personal problems. The art is almost photographic and the technical side of it, not only of the 1960s space technology but of the near-future tech, is both accurate and wonderful to look at. The shadowed faces of the returning astronauts adds a dramatic punch as you can't see them directly but you can feel their shock and frustration. It's great art and the feelings and attitudes of each character are clear in their expressions. As this is more of a drama/mystery than it is a space adventure, this kind of art suits it just right. You want to feel what the characters are feeling and see by the looks on their faces how certain things are affecting them. This gives you that in spades and the emotions of the moments stand out. Of course, this is all helped along by Richard Marazano's great script. There's no narrative, just dialogue, and that's because everything you need to know is happening on the page and you don't need to be told what's going on. The dialogue is sharp, especially in the 'interrogation' scenes, and even though the story does require some exposition it doesn't seem forced and it certainly isn't boring. My issue with this first volume is that there's a deep, intriguing mystery here but some of the space to tell that story has been used to tell the story about the rocky relationship between Helen and her daughter Sofia. It's an interesting relationship, and it certainly gives Helen's fateful decisions some emotional depth, but as a science fiction fan first I wanted to hear more about the mystery. Still, this is the first volume and it really gets going about two-thirds of the way through so I have the feeling that my wishes might come true. This is an excellent first part to what appears to be a wonderful series. Let's hope that they can keep up this quality in the next episodes. Con-Quest is a one day show packed with all manner of gaming activities and trade stands. Whether it’s role playing games, board and card games or miniature wargames, Con-Quest has them all, as well as trade stands offering everything from the very latest releases to collectables and hard to find items. Whatever your gaming needs Con-Quest aims to deliver! The event will be taking over the majority of the Assembly Rooms, offering numerous areas for demonstration and participation games, game manufacturers and designers, trade stands and areas to simply meet up with friends and catch-up on one of the bars or cafes on site. The event is family friendly and welcomes both veteran gamers as well as those just wanting to find out more about the gaming hobby. Do you have a favourite place where you like to game? Have you been to every corner of the world, looked under every rock, climbed every mountain, crossed every stream? Has every devil, demon, bad guy, evil wizard or offensive smell been defeated? Then what you need to do is re-invent the game you’re playing. This is not always easy – many players enjoy the world you have described and their role in it. So how can you recapture the grandeur and power of the games you have already done? Well, you can recapture those highs – and what’s more, you could make them better. All fantasy game worlds have something in common. They all have geography and a period, but they also have a history. You could have the history as a background to the adventures the PC’s are having, with enemies of old resurfacing or ancient artefacts of the Old Kings/Gods/Magic Squirrels coming to light. Even so, there’s only so much the PC’s can do before the quests are burnt out. Living in the real world, we are constantly reminded of our history and the role it has had in shaping our present day lives. The same can be said of gaming worlds. We sometimes imagine what it would be like to live during those days, but the great thing about role-playing is that you can actually do that. For example – lets take Lord of the Rings. The main bulk of the story and the central core of the work is the War of the Ring, which many people know and love, but there is a whole plethora of background material set thousands of years before the main books that had an influence on the cause and the outcome. To re-invent the world your players are gaming in, you could go back to those ancient times and actually play those legends spoken of in the game, be those characters whose names grace the pages of history, and actually be responsible for the making of the ancient songs and stories. Most game worlds have a pre-written history so you may think its difficult to create a story out of an already structured past, but at the end of the day its your game to mess with. The history the characters know of their game world may just be the tip of the iceberg – there could be plenty of stories never told, or forgotten, during ancient times. Or the history could be false; the evil and threats of old may actually have been benevolent forces but have been given bad reputations by the victors of history. This is a great way to turn the players beliefs on their heads – they go into a game set thousands of years before with preconceptions of how some of these historical figures may be. Perhaps the creation of the world is completely different to what they have been led to believe by those in power – this makes the games fresh and non-predictable, with surprises and shocks around the corner. But how to get the players back in time? Well, the simplest way is to have them roll up fresh characters and have them begin their new games in this ancient age, where certain races or cities may not yet exist, or the same may exist but not in the future. They would be familiar with the territory but not with the content of it. This can create some great games. Alternatively, they could choose names that share the same identity of certain locations and actually be the character that gave their name to it in the first place! This is an excellent way of combining both role-playing and a sense of combined creativity, giving the players a hand in the actual creation of the world. Another way is to have the characters actually go back in time, through a rift in the planes of existence or a magical spell that controls the flow of time. Having PC’s from the future of your game world interacting with a past, which will bring to the surface all the preconceptions and assumptions the PC’s have of their history, is difficult but immensely satisfying. If done correctly, the players will be subjected to the awe and grandeur of interacting with a place they thought they were prepared for. It makes for some fantastic role-playing opportunities. The history of a game world can be rich and detailed but don’t let this throw you – there are plenty of things you can change to make it work. It is your game, after all, and no doubt the players will have a working knowledge of the past, especially if they have been playing in the game world for so long. Re-designing the past can be exceptionally satisfying for a GM, but can be even better for the PC’s when they are subjected to those changes. After all, not only will it change their attitudes to the history they thought they knew, but also to the future where they originally adventured, creating opportunities for new ideas and events in the world you like to game in the most. News about UK Games Expo 2013 – the UK’s largest Hobby Game Convention. War. Field of Glory. Carcassonne UK Championship. Dominion. Netrunner National Finals. WALK UP AND ASK TO JOIN IN! turn up and pay on the day. SUNDAY. These are GREAT for everyone as EVERYTHING is going on. Families bring your children! open to all and NOT restricted. details about the Family zone, Seminars, Author and Artists and much more. Just get reading. SINGLE DAY TICKET: Adults £8, Child (10 to 15 years) £5. Family £20. TWO DAY TICKET: Adults £14, Child (10 to 15 years) £9. Family £35. THREE DAY TICKET Adults £18, Child (10 to 15 years) £10. Family £40. FRIDAY ONLY TICKET Adults £5, Child (10 to 15 years) £3. Family £10. FAMILY TICKET admits 2 adults and 2 children. Some Tournaments and specific events have additional charges – see website. MINDJAMMER PRESS is a British games publisher founded by Sarah Newton (Mindjammer, Legends of Anglerre, The Chronicles of Future Earth, Achtung! Cthulhu) and Chris McWilliam to produce roleplaying games and related fiction, including the transhuman space opera novel Mindjammer and the upcoming second edition Mindjammer RPG for Fate Core, The Chronicles of Future Earth, and Monsters & Magic. Find out more about Mindjammer Press at www.mindjammerpress.com or follow them on Twitter @MindjammerPress or Facebook (www.facebook.com/MindjammerPress), or by email at info@mindjammer.com. 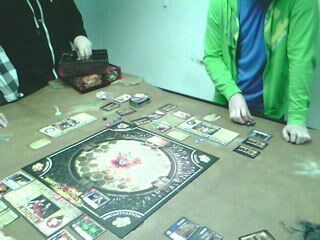 CHRONICLE CITY is a new British based games publisher set up by Angus Abranson (ex-Cubicle 7; Leisure Games) in February 2012. Chronicle City are working with a number of companies and designers to publish their games, as well as designing their own roleplaying, card and board games.